Some people are natural negotiators. They are the smooth-talkers who always manage to say the right thing to get exactly what they want. Where most of us are at least somewhat fearful about the idea of negotiation, these people seem to enjoy it. Introverts tend to flourish when they have researched and prepared in advance. By researching, you armor yourself with the facts. This is vital, because you no longer have to rely on your opinion or emotions, both of which can be difficult for introverts to openly share. Figure out what the going salary is for someone in your location and with a similar level of experience. Collect data from multiple reliable sources. Then create a list of everything you've accomplished in the last year. If you've saved the company a significant amount of money, for example, be sure to include that in your documentation. Think about how the other party might potentially respond to your negotiation request. For example, if you are asking for a raise, how will you respond if they agree? What if they disagree? What if they completely blow you off? Assess every possible outcome and how you will handle it. Consider what you're asking for. Do you have a bottom line? What would be the bare minimum you hope to gain from having this conversation? Nothing is worse for an introvert than being thrown for a loop, so be realistic and plan for the unexpected. So many opportunities are missed because people aren't sure how to ask for what they want, or are too afraid. Share your data, get to the point, and ask for what you want. If the other party doesn't agree with your terms, it is likely because they either didn't believe the facts, or they don't have enough resources to sustain your claim. Either way, you never know what you can gain unless you ask. Typically, introverts love to take their time to think about what they're going to say before they say it. Because of this, any long pauses or any unexpected questions can instill a fear of the unknown. Long pauses, however, can be used to an introvert's advantage. Rehearse everything, from how you will enter the room, how you'll greet the other party, and how you plan to take hold of the conversation. Avoid going into in-depth explanations as to why you want what you want. Stick to the facts. 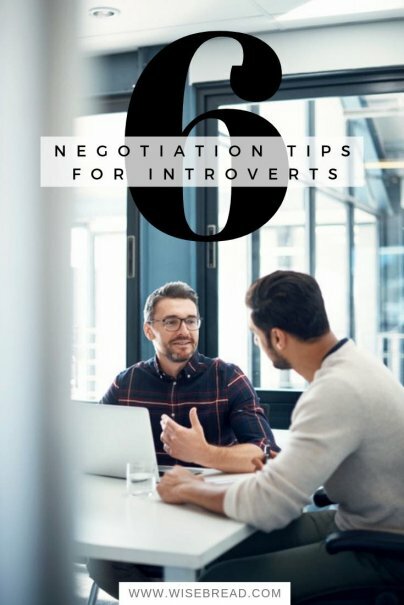 It might feel somewhat silly to practice your negotiation tips, but the more you rehearse, the more your confidence will grow. Notice if you're fidgeting, stuttering, or speaking unclearly. Remember, keep your responses short and to the point to clearly communicate what you're asking for.